Engineers are already preparing for the migration from LTE/LTE-Advanced to 5G. In this early stage, it is becoming apparent that new waveforms will have to be utilized to address the proposed 5G networks. 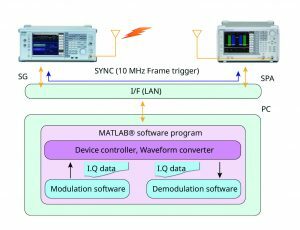 To get a jump on 5G designs, engineers need a new set of test tools that can conduct signal analysis on emerging waveforms being proposed for the next generation of wireless technology. LTE/LTE-Advanced uses Cyclic Prefix Orthogonal Frequency Division Multiplexing (CP-OFDM) as the wireless signal multiplexing method, because it has high spectrum efficiency, as well as high tolerance against multipath propagation and fading. CP-ODFM, however, is not without its issues when it concerns 5G designs. A CP-ODFM signal requires high linearity to output power amplifiers according to its high peak to average power ratio (PAPR). As a result, the power amplifier efficiency is low, increasing the UE battery power consumption. The result is there are problems with shortened hours to receive wireless services. Another factor is that the CP-OFDM spectrum has high out-of-band (OOB) side lobes, causing problems with lowered spectrum efficiency when many UEs are operating at one location. To improve CP-OFDM and make it possible for it to be used in 5G systems, a number of technologies, including Filtered Multi-carrier, are being evaluated. Filtered Multi-carrier is being examined to reduce the OOB side lobes and is recognized as a “New Waveform.” Various methods have been proposed for implementing the Filtered Multi-carrier technology to improve CP-OFDM using sub-carrier filtering but each filtering method is different. 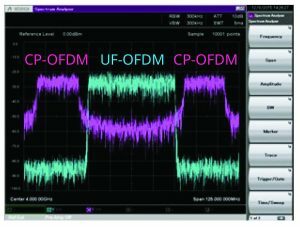 Since these new waveforms are different from the CP-OFDM waveform used in LTE/LTE-Advanced, PAPR and spectrum shape are also different. As a result, designs optimized for CP-OFDM are no longer well suited for the proposed waveforms. Therefore, RF devices, UEs and base stations for 5G systems will require advanced test instruments to generate and receive new waveforms for their various performance evaluations. R&D activity for the new technologies requires a versatile engineering tool that can provide seamless use of communication system simulation and verification by actual instruments. Figure 1 shows a configured new waveform analysis environment that includes the MG3710A Signal Generator with Arbitrary Waveform Generator (AWG) and MS2692A Signal Analyzer from Anritsu Company for waveform capture and analysis, as well as a MATLAB® program for generation and analysis of transmitted and received waveforms. A system such as the one described above allows engineers to evaluate the impact a potential 5G waveform can have on existing waveforms. For example, the system can evaluate a LTE/LTE-Advanced CP-OFDM waveform with band gap and Universal Filtered Orthogonal Frequency Multiplex (UF-OFDM) waveform, which may be used for 5G. The impact of interference is evaluated when the defined waveforms are located side by side in the frequency domain. The MG3710A Signal Generator can easily output desired and undesired signals by using an Add Baseband function to synthesize and output two modulated signals from one RF signal. This evaluation uses the capability to generate and synthesize CP-OFDM and UF-OFDM waveforms, and analyze the signal using the MS2692A Signal Analyzer. The result is engineers can accurately evaluate giving and receiving interference. Figure 2 shows the spectrum of the CP-OFDM waveform having band gap and the UF-OFDM waveform. The purple trace and the blue trace correspond to the CP-OFDM and the UF-OFDM, respectively. OOB side lobe of CP-OFDM and excellent UF-OFDM OOB characteristics are shown in the figure. The output spectrum of the synthesized two waveforms is shown in Figure 3. Figure 4 shows the impact of interference on CP-OFDM from UF-OFDM. An undesired signal is injected to the band gap of CP-OFDM, so engineers can measure EVM (Error Vector magnitude) of individual sub-carriers at the higher frequency. The horizontal axis indicates normalized sub-carrier position and the vertical axis indicates EVM of each sub-carrier. The two traces in Figure 4 correspond to UF-OFDM and CP-OFDM used as interference. 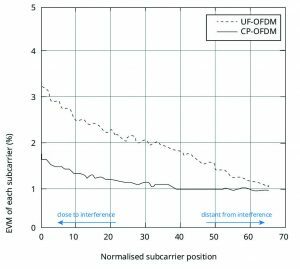 It is clearly seen in Figure 4 that UF-OFDM results in lower EVM for all sub-carriers. Thus, it is confirmed that UF-OFDM has better OOB characteristics than CP-OFDM. 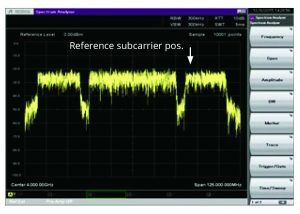 By using this analysis environment with preparation of multiple 5G waveform candidates, OOB characteristics of each waveform, interference caused by them and spectrum allocation adequacy can be evaluated easily. The Anritsu-based solution allows engineers to conduct tests on their 5G designs and more accurately predict their behavior in a real-world environment. Engineers can get a head start on their designs, helping to bring 5G products to market faster and ahead of the competition.